1. PRIME MINISTER DESAI HAS ORDERED THAT ALL EXPORT OF MONKEYS BE BANNED AND THAT NO NEW COMMITMENTS BE RECOGNIZED. AN OFFICIAL NOTIFICATION OF THE BAN IS EXPECTED WITHIN A WEEK. 2. THIS ACTION FOLLOWS CLOSELY UPON PRESS REPORTS HERE THAT THE INTERNATIONAL PRIMATE PROTECTION LEAGUE (IPPL) HAD APPEALED TO THE P.M. BECAUSE OF USE BY US ARMY OF RHESUS MONKEYS EXPORTED FROM INDIA FOR NEUTRON IRRADIATION TESTS. IPPL REPORTEDLY ASKED THAT GOI EITHER BAN EXPORT OF RHESUS OR INSIST ON STRICT ENFORCEMENT BY THE US OF CONDITIONS UNDER WHICH THE MONKEYS ARE USED. THE US-INDIA AGREEMENT LIMITS SUCH USE TO MEDICAL RESEARCH AND VACCINE TESTING. At the time I had been living in Bangkok and became fascinated by nonhuman primates and sickened by the brutality with which they were often treated in research laboratories. That is why I founded IPPL. 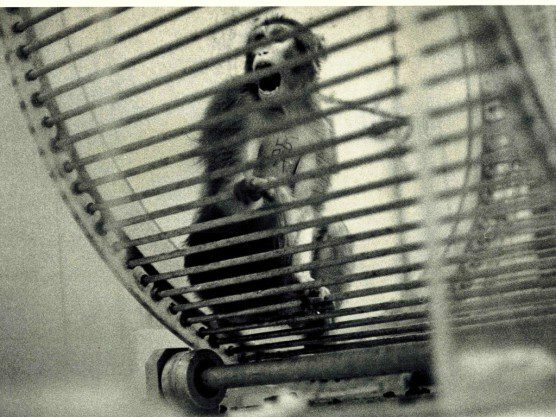 Monkeys from India, like this one, were forced to run on tread wheels after being irradiated, until they died. On June 22, 1977, an article appeared in the Washington Post about the use of monkeys in military experiments involving neutron radiation. The experiments were being conducted at the Armed Forces Radiobiology Research Institute in Bethesda, Maryland. Monkeys imported from India were being trained by electric shock to run in tread wheels. Then the animals were exposed to massive doses of radiation and placed back in the tread wheels. They developed radiation sickness and vomited for hours on end, all while being electro-shocked if they did not rotate the wheel at or above one mile per hour. They had to do this until they died, which sometimes took hours in the case of monkeys exposed to lower radiation doses.  For months, IPPL contacted U.S. government officials as well as the International Primatological Society, seeking an end to the experiments. IPPL asked our then-members to send protests to the U.S. government in our September 1977 issue of IPPL News. The Director of the Defense Nuclear Agency announced that “To the best of our knowledge, the animals experience no pain in the radiation experiments, though some of them do die.” Reports on the experiments obtained by IPPL show this was not true. The poor monkeys suffered horribly. We gave up on contacting U.S. officials! So we decided to tell the people of India what was going on. At the time there was no Internet so to get information about the world’s newspapers, one went to a huge book with a bright red cover called “Editor and Publisher.” It listed all the world’s newspapers. There were many in India, a country where many languages are used. We prepared press releases, telling of the cruelty with which monkeys exported from India were treated and seeking an export ban. We also contacted Prime Minister Morarji Desai. They were sent to all English-language and vernacular newspapers. 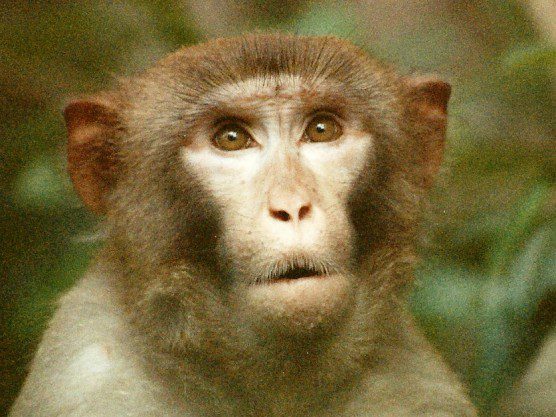 IPPL has always believed that ALL monkeys, including rhesus macaques like this one, deserve to live free. To our amazement, newspapers all over India ran the story. On November 9, 1977, the Times of India ran an editorial denouncing the experiments and calling for an export ban. Then, on December 3, 1977, Prime Minister Morarji Desai, a man of immense compassion, made a stunning official announcement: India would ban the export of its native monkeys. Now, thanks to WikiLeaks, we know that the U.S. Embassy was monitoring the situation and that it blamed IPPL for the export ban—which remains in effect to this day. 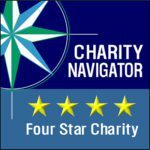 IPPL had challenged two powerful governments—and won!